Some nights I just don’t feel like spending a long time in the kitchen preparing supper. In fact, the less time I need to spend making food the better! You can probably relate to the dinner rush right? It’s a stressful time of the day, but I still want to serve my family a delicious and healthy meal. Cereal for supper doesn’t go over too well with John! 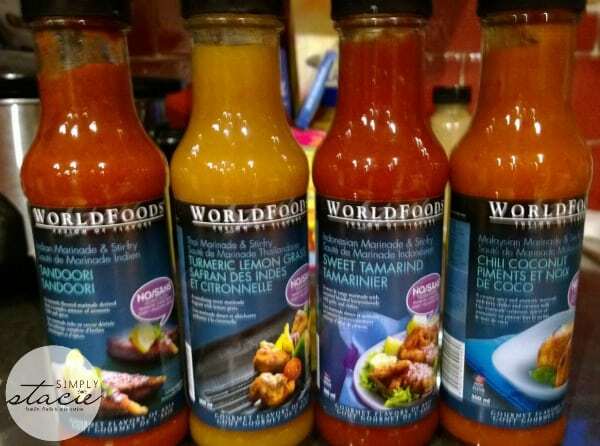 I’ve discovered a whole new way to cook easy, flavourful and interesting meals thanks to WORLDFOODS cooking sauces and marinades. It was my first time ever trying this brand, but it definitely will not be the last. Not only did their products help me serve supper in under 15 minutes, but they were also a hit! We were also exposed to new Asian flavours that we had never before experienced. I’ve certainly been missing out! Even if you’ve never cooked Asian before, WORLDFOODS makes it easy. You can’t go wrong with their cooking sauces and marinades. What I like about WORLDFOODS is that their products are 100% natural and they only use fresh quality ingredients. I’ve been following a diet striving to eat less processed foods and I appreciate that WORLDFOODS uses no preservatives, artificial flavours or colours and no GMOs. Their products are also trans fat free and gluten free. Indochina Cambodian Pineapple Lemon Grass Stir-Fry Sauce: A delicious Cambodian stir-fry with coconut milk, sweet crushed pineapple and lemongrass. Perfect with meat, seafood or vegetables for an authentic Cambodian dish. Thai Green Curry Cooking Sauce: A mild curry sauce with creamy coconut, authentic Thai coriander, lemon grass and other authentic spices. Perfect for preparing a quick and yummy Thai Green Curry with meat, seafood or vegetables. Thai Red Curry Cooking Sauce: A rich, spicy fragrant creamy curry sauce spiced up by Thai red chilies and flavoured with aromatic spices. Perfect for preparing a quick and authentic Thai Red Curry with meat, seafood or vegetables. Thai Yellow Curry Cooking Sauce: A medium rich fragrant creamy curry sauce spiced with turmeric, accompanied with Thai spices and herbs. Perfect for a quick and easy meal with meat, seafood or vegetables. Indian Tandoori Marinade & Stir-fry: An intensely flavoured marinade derived from a complex mixture of aromatic herbs and spices in a sweet coconut milk base. Ideal to be used with meat, fish, poultry for roasting, grilling, pan-frying or barbecues. Malaysian Chili Coconut Marinade & Stir-Fry: A spicy and aromatic marinade with sweet notes of coconut milk complemented with turmeric and spicy chilies. Ideal to be used with meat, fish, poultry for roasting, grilling, pan-frying or barbecues. Thai Turmeric Lemongrass Marinade & Stir-Fry: An authentic tasting marinade which gives meat a burst of flavour with fragrant lemongrass and a blend of Thai herbs and spices. Perfect to create and authentic Satay dish. 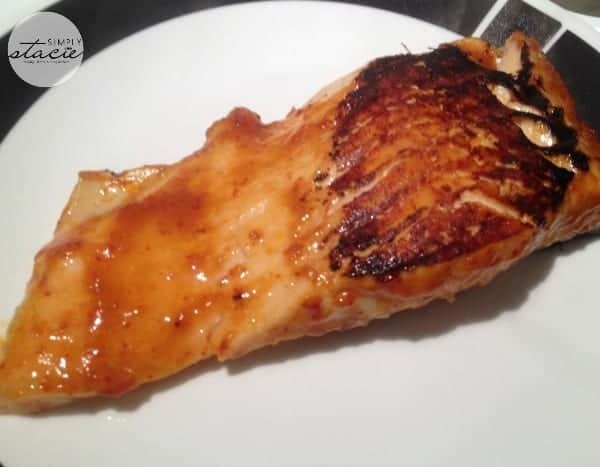 Indonesian Sweet Tamarind Marinade & Stir-Fry: The combination of sweet, tangy and savoury flavours of tamarind blended harmoniously with garlic and chilies is perfect to enhance chicken, pork or seafood. Ideal for roasting, grilling, pan-frying and barbecues. I’ve only recently discovered curry and I’ve been hooked ever since. 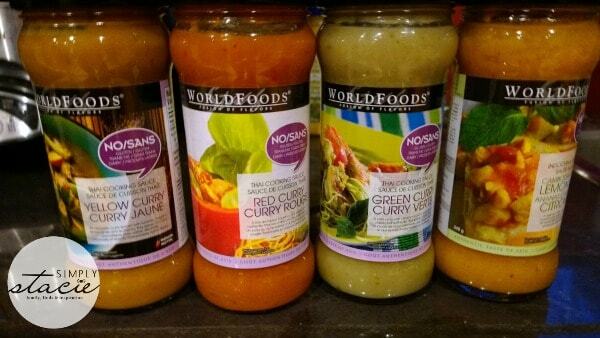 WORLDFOODS has authentic Thai Curry cooking sauces in Red, Green and Yellow. Red Curry has red chilies, Green Curry has green chilies and the Yellow Curry has turmeric. If you’re familiar with Indian cuisine, the Yellow Curry is the most similar to what’s used there. You can use all three varieties to make a Basic Thai Curry with just the addition of a couple ingredients. Stir-fry your meat in a wok for 4 to 5 minutes. Add in a jar of the Thai Curry Cooking Sauce and bring to a boil. Reduce heat and simmer for 15 to 20 minutes. Serve with rice or noodles. 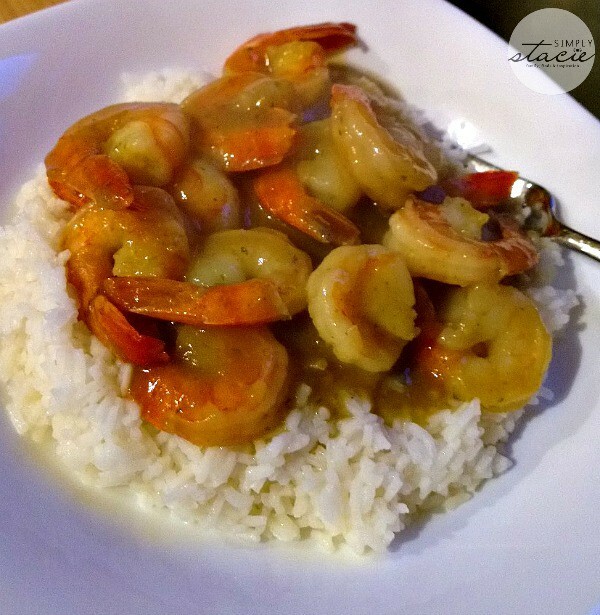 I had some frozen shrimp to use up so I decided to make a Thai Green Curry with Shrimp and Rice. I liked that it wasn’t too spicy and it had a unique flavour that permeated the shrimp. I think the Green Curry was my favourite of the three I tried! 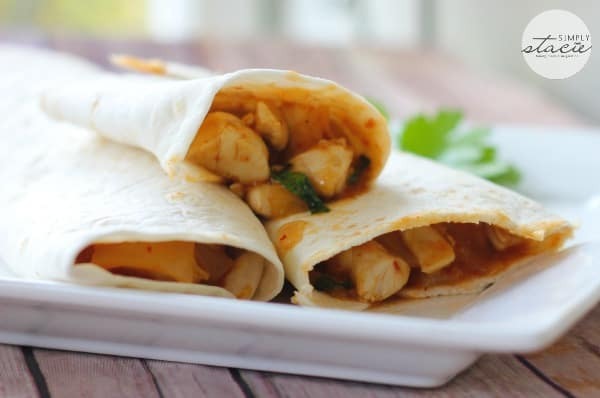 I made Thai Red Curry Chicken Wraps that were amazing and so easy to make! I sauteed one chopped onion in a little bit of oil for about 5 minutes. Then I added in 2 uncooked boneless, skinless chicken breasts, cubed, and cooked until there was no pink remaining. I added in my Thai Red Curry Sauce and brought to a boil. Then I simmered the mixture for about 20 minutes. For the last few minutes of cooking, I added in some chopped fresh cilantro. 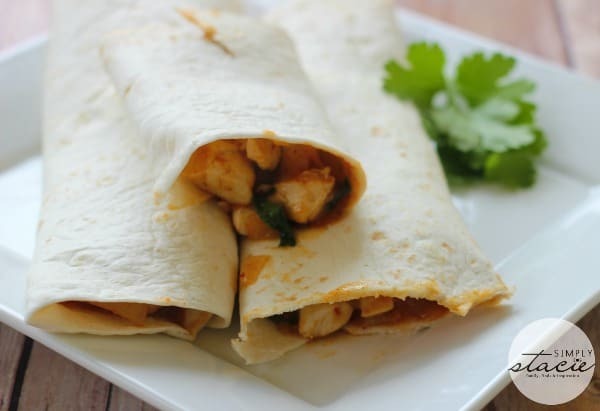 Serve on a wrap and enjoy! There’s no need for any extra sauce since the Thai Red Curry provides plenty of it. The Thai Red Curry Cooking Sauce is very versatile and will go with almost any kind of meat, fish or vegetable. It’s spiciest curry sauce of the bunch! 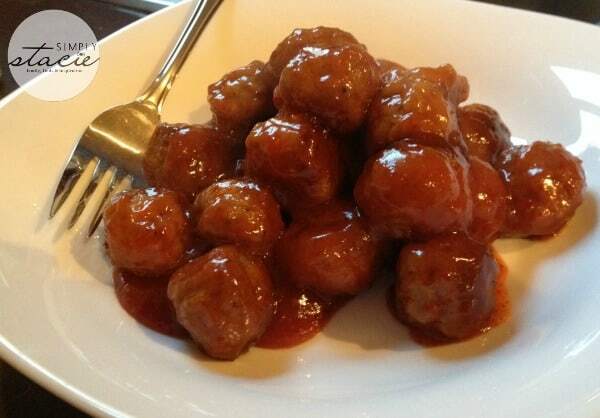 Another easy meal idea is to use some frozen meatballs with one of the marinades. I served up my meatballs with Indonesian Sweet Tamarind Marinade/Stir-fry sauce. I cooked the meatballs separately in the oven and then heated up a bottle of the Sweet Tamarind sauce in a pot on the stove. When the meatballs were ready, I added them to the sauce to cover and then served. Serve them with rice or just eat them on their own. They are good either way. I like the combination of sweet and spice! I picked up some salmon on sale the other day at the grocery store and thought about trying it with one of the marinades. I ended up selecting the Malaysian Chili Coconut Marinade Stir-fry. I brushed it on the fillets and grilled it on our indoor grill. I was wondering if the sauce would come off while it was on the grill since sometimes that happens, but it turned out beautifully and the marinade stayed! I could taste it in each bite….more sweet than spicy. It was a lick your plate kinda meal! As you can see WORLDFOOD cooking sauces and marinades are extremely versatile. I like that I can pretty much use them with any ingredients I have on hand. There’s no shortage of recipe ideas and I think you’ll be inspired to create fun and tasty dishes that your family will enjoy. If you need a bit of inspiration, there’s a bunch of recipes on the WORLDFOOD website. I’ve bookmarked a few that I want to try including these Tandoori Chicken Nachos, Butterfly Prawns with Pineapple Lemon Grass Sauce and Pumpkin Curry Soup. WORLDFOODS is a global company and their products can be found all over the world. You can look up where to buy in your country easily on their site. In Canada, I was able to see what stores sold them by province. In Nova Scotia, the closest store to me would be Valley Natural Foods in Greenwood. I shop there all the time so I’ll be looking for them next time I’m there. Connect with WORLDFOODS on Facebook, Twitter and Pinterest. YUM! Those chicken balls looks sooo tasty!